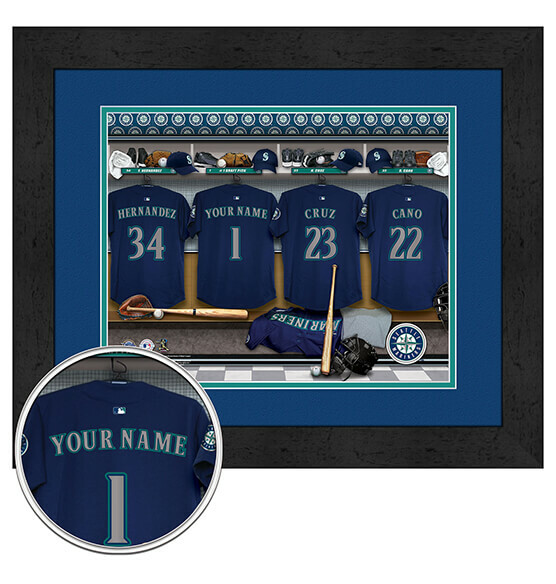 You'll go down as one of the best gift-givers in history when you give the Seattle Mariners fan in your life this Personalized Uniform Locker Room Framed Wall Art from PersonalizedThings by Exposures! Just specify the name up to 12 characters that you want added to one of the four Mariners jerseys in this printed locker room scene. Perfect for holiday, anniversary or birthday gifts, this one-of-a-kind framed artwork captures the dreams of every baseball fan. Featuring a black frame, a digital double mat in team colors and a full-color wrapped glass print, you'll hit your next gift exchange out of the park with this custom M's sports decor.